Agent Robert Noel, Lancaster Herald. 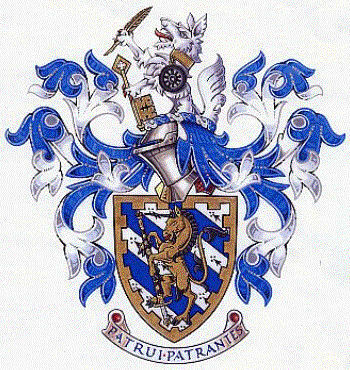 Arms: Ermine the spots bendwise, 3 bendlets azure over all a unicorn rampant Or armed maned bearded unguled & tufted sable supporting the City of Bristol Lent sword scabbarded hilt in base proper a bordure embattled Or. Crest: A demi-wolf argent gorged with a plain collar Or suspended therefrom by a chain also Or a wheel sable holding in the dexter claws a quill pen feathered and supporting in the sinister claws a key wards downwards and inwards Or. The field of ermine and blue is taken from the arms of Torquay where Mr Uncles was born. Blue, white and black are also used in the arms of the Province of Connaught where his family had its roots in the 18th century. Most of Mr Uncles' working life was spent in the service of the City of Bristol and concluded with being Lord Mayor's Secretary and Swordbearer, hence the unicorn (one of the City's supporters) and the portrayal of the City's Lent Sword which dates from the 15th century. The crest reflects Mr Uncles' surname. Uncles being an Anglicisation of Ulfkettel, meaning wolf cauldron. The quill and key allude to his profession as a Chartered Secretary and the wheel to his lifelong interest in railways and transport history. The embattled bordure began as an attempt to portray railway sleepers !